AncestryDNA is pretty limited with what you can do when you get your results. I say limited but it’s meant to be simple. 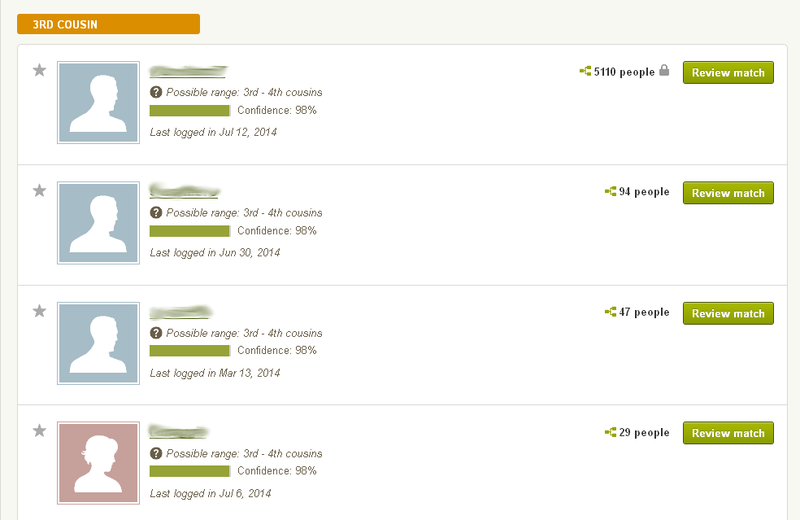 If you are thinking about doing a DNA test, I definitely recommend AncestryDNA but plan on using other tools with it. But here’s what you see with your matches. If you look closely, you can see the first match is locked. This particular match has their family tree private. You can “look” at the match and you may see their ethnicity breakdown but for this match – that’s all I see. I can’t see surnames or his family tree. I’ve messaged him but he is unwilling to let me view his tree. Bummer. The other matches are unlocked and I’m able to see their direct tree and a list of surnames in their family tree. You can also view their direct ancestors. If you have a paid subscription to Ancestry, you can click to view their whole tree. That’s about it. It’s very limited as to figuring out where yours and their DNA intersects. I would love to see some basic tools or even a report generator. A few tools could make AncestryDNA awesome. Since getting the AncestryDNA results, we’ve downloaded the raw DNA data and uploaded it to GEDmatch. My mom’s kit number is A875112. I’ll write a post on GEDmatch soon. If you are a match to our kit please contact me – contact form is on the About Page. I’ve also transferred DNA to familytreedna.com and I’ll post about that as soon as I get the results in.